I was looking for something to read while awaiting the next Gray Man novel and,to my pleasant surprise, found this. Well written, fast- paced, taut, technically competent in all aspects it exceeded my expectations. Evan Smoak now takes his place in my preferred band of furtive yet fearsome “heroes”...with the likes of Court Gentry, Victor the Assassin, Mitch Rapp, John Rains, et al. Through a series of flashbacks, we see 12-year-old Evan Smoak inducted into the Orphan program. In this highly covert, government-funded program the Orphans become some of the best assassins in the world. Years later Evan has gone underground. No longer an agent he becomes the Nowhere Man, a moniker he obtains due to the number those in need call, 1-855-2-NOWHERE. With his skills, Evan can help those with no other recourse. Ones in dire straights with no way of improving their situation. Defending his latest client becomes difficult as Evan learns his cover is no longer intact, and those from his past are out to kill him. Through a series of flashbacks, we see 12-year-old Evan Smoak inducted into the Orphan program. In this highly covert, government-funded program the Orphans become some of the best assassins in the world. Years later Evan has gone underground. No longer an agent he becomes the Nowhere Man, a moniker he obtains due to the number those in need call, 1-855-2-NOWHERE. With his skills, Evan can help those with no other recourse. Ones in dire straights with no way of improving their situation. Defending his latest client becomes difficult as Evan learns his cover is no longer intact, and those from his past are out to kill him. 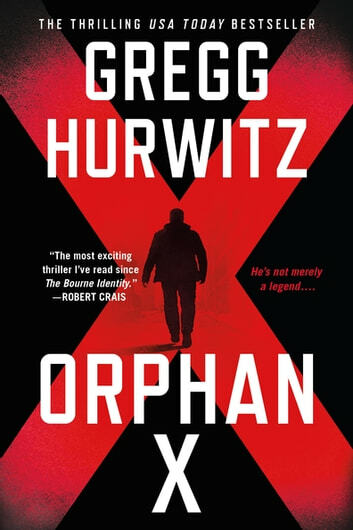 As I started Orphan X by Gregg Hurwitz, I was a little unsure what to expect. Then on page one, there is an acknowledgment "to all the bad boys and girls, rulebreakers, and vigilantes --- for being so wicked that they're good." One of the greatest I have seen. Vigilante stories attract me. Taking an impressive skill set that can harm and using it to help is, well, the stuff of superheroes. And something I can get behind. Evan's handler Jack gives him harsh training to make him the best of his field. Slowly we observe Jack's relationship with Evan goes deeper than the job. Procedures, or commandments, taught to Evan include never let an innocent be harmed. One thing other Orphans don't seem to mind. Jack often tells Evan the hardest part is keeping him human, implying Jack cares he stay that way. Which validates that Evan would choose the path he did after going underground. You can't help but root for him and worry for him. Even hope the brief connections he makes with those outside his job will lead to a personal connection. The author does an excellent job of making Evan sympathetic. Orphan X delivers on the suspense. Whether coming from the tension of his missions or the fear Evan will be found by those seeking to harm him, this story is a page-turner. There is action, and subterfuge, and even a bit of a twist I did not see coming. If I were to mention anything slightly negative, and this is minor, I am lost in the fight scenes sometimes. Specific style names about fighting techniques get lost on me. Usually, I gain definition through context. A fight is a fight. I retain the overall events, but the specific descriptors don't help me much. I finished Orphan X and immediately started Nowhere Man. I am fully rooted in Evan Smoak's world and cannot wait to see what happens next. I was granted an ARC copy of this book by St. Martin's Press through NetGalley for my honest opinion. I encourage every reader to reach their own conclusions. All the technical stuff is mind boggling but the plot keeps you hanging on. An elegant rendition of a familiar theme. Vivid authoritative descriptions of conflicts employing martial arts and firearms. Orphan X displays the chivalry of knighthood in a selfless battle defending the innocent from evil. The Walter Mitty in all of us will find much to admire. In spite of polished editing and excellent writing I could not relate to such an improbable hero. Three stars. Excellent ,suspenseful and easy read! Almost believable! Children slipping through the cracks of society and no one notices.